Serah’s absence during the timespan of XIII can be summed up as ‘almost all of it’. In the beginning, Serah appears unconscious. She’s nearing the tipping point of becoming a cie’th or turning to crystal - effectively she’s close to death, and it’s not a good indicator of her as a person. Serah is not seen again linearly until the very end of the game when she’s revived from crystal stasis, embracing Snow and forgiving her sister. However, those aren’t the only times she’s seen in the narrative. Despite being minimal, Serah has a role to play in XIII, and she has a massive impact on the unfolding events in the game. 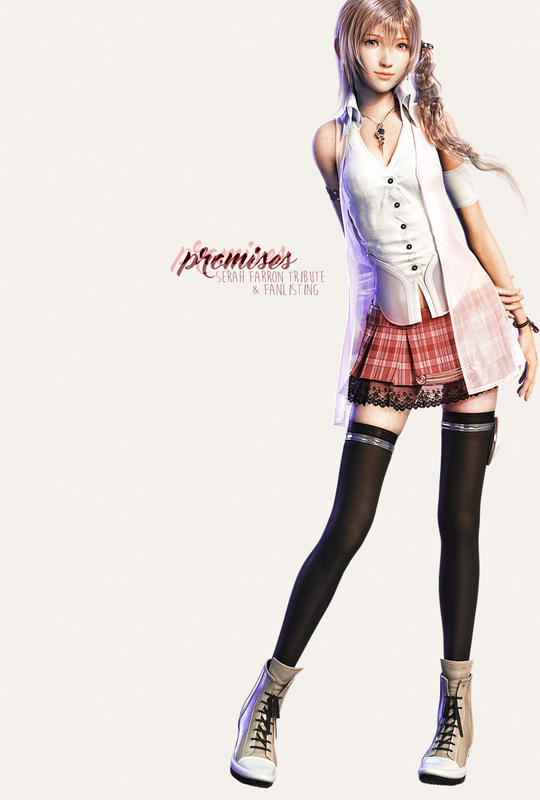 Serah is the catalyst for pretty much everything - her mere presence is enough to start it off. Vanille and Fang wake up because Anima sensed Serah nearby and opened a door into the Vestige; Dajh, Sazh’s son, becomes a l’Cie because the Vestige is recognised as Pulsian and the Cocoon fal’Cie feels threatened; Serah’s the reason for the Purge because she and Snow tried to defy the Sanctum when she’s discovered; and Serah’s the reason the party becomes l’Cie as, regardless of the goals that led them there, they all end up being present when she crystallises. And Anima uses its conveniently on hand pawns because that’s a fal’Cie’s favourite pastime. In addition, Serah is always, always Lightning’s motivator. That’s important too. In all cases, Serah is the trigger, her every action inciting a rippling effect elsewhere in the narrative. No Serah, no inciting incident, no story. Serah also betters the party in the aspect that she gives them the idea that they can challenge and beat their Focus, because she did it first. There are six of them, and the lengths they can go to are far greater - for Serah, she was alone, without options, and without time. The plus side of the party being dropped into a crystallised Lake Bresha is that they’re already on the run; they get to experiment with their magic and exceed their limitations. Serah has to stay undercover in Bodhum or risk being killed. The more stress to a l’Cie, the quicker the brand accelerates, and Serah never had the power nor ability to save Cocoon herself. What she did have was Snow, and it’s Snow that immediately jumps to defiance and the notion of actually, well, saving Cocoon whilst everyone else is still trying to adjust to their new reality. Snow simply had a head start in riddling out options and believing, because when Serah became a l’Cie and he aligned himself with her - forever, infallibly, through proposing - it was just as much his problem as it was hers. When Sazh asks Snow to give him a reason, he says Serah. No one then can believe it; it’s her fault they are in this situation. But eventually, they do. They take and break their Focus down, and save Cocoon. They decide. They believe in her, too. Much of Serah’s tale is told in intermittent flashbacks, and none of them are in sequence - her story does exist within the game’s on-screen canon, but it is just a lot more condensed than those of her sister’s companions. It has already started, and closed, prior to the game’s start, with her story’s ending coinciding with the very first sequence shown to the player. One of my favourite things about XIII is that, at the start of the game, the party are presented at varying stages of their worst selves (except for Snow - that comes two games later). They are unhappy, isolated, frightened, and closed off: they each have different ways of expressing it. They are far from their best. Coming across misreadings of the XIII cast is common in the fanbase, often from those that abandoned the game shortly after the prologue, mistaking the cast’s reactions to becoming l’Cie as their sole personalities. All of the cast has to grow on you, as much as they themselves grow in turn. The player comes to them as fugitives, and this is not how these characters act on a day-to-day basis - this is how they react when thrust, against their will, into something impossible, where they become the thing their society abhors and are exiled because of it. To be blunt, everyone is having a very bad day, and gradually, they manage to have a slightly better one where despite the continued struggle, they have hope. Incidentally this is after their lowest point, which is also when their eidolon appears (except for Snow. His is more a test of his resolve). The only way left for them is upward. This is not a role exclusive to the party. Serah goes through her worst self too, prior to the start of the game. It is resolved in the same timeframe. Like the party, Serah goes through a period of turbulence and self doubt. But whereas they have each other, however frictional, Serah is entirely alone and literally isolated from her peers. Spend any time on the Archylte Steppe with its many cie’th stones and this is not unique to Serah; a lot of l’Cie feel this way and that pushes them over the edge. Chronologically, Serah’s first act in on-screen canon is to break up with Snow. Serah is not honest about this - she simply tells him it’s over between them and implores him not to keep digging for reasons why. This is her worst self - the self that pushes other people away by hurting them, being self destructive, and isolating herself in the process. It is also for his sake, so he isn’t involved, but Snow is nothing if not persistent and that willingness, that reaching out, is what makes Serah tell Snow the truth. She reflects on her actions, realises they were wrong, reconciles, and never reaches true despair (and doesn’t gain an eidolon), because Snow is there to talk her out of it. Running away, leaving behind the people you care about, is not love. Shutting others out does not bring trust or resolution. This, she figures out for herself, and Serah shares these thoughts with Vanille. All Serah wants is for someone to stand by her, for someone she can count on, which is not much to ask. But instead Serah tried to shut Snow out, just as Lightning shuts Serah out when she tries to tell her sister that she’s a l’Cie. This is behaviour Serah has learned from Lightning - that protecting someone can often lead to distancing yourself from them. The difference is that Lightning succeeds and sounds convincing because she’s had a lot more practice at it - Snow’s accusation is not without basis, because Serah tried to do the same to him. But it’s an armour Lightning refuses to take off. This moment, when Lightning shuts Serah out, is perhaps the greatest catalyst. When Lightning doesn’t believe Serah, her sister is lost to her forever, and that is the moment which starts a thousand year journey of forgiveness and redemption, all in order for she and her sister to be together again. No Serah, no motivation, no story.